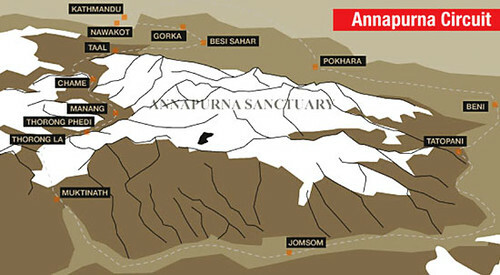 The 10-day mountain bike race around the Annapurna Circuit is the highest and hardest in the world. I am a very fit cyclist and experienced rider, but when I took part in the race last year it was the most challenging thing I had ever done. Which is why I came back in 2013 to participate in the seventh edition of the North Face Yak Attack. This year’s race saw some of the hottest days on the first four stages in race history and the most snow on the higher stages. After the first four days from Kathmandu to Besisahar, the fifth stage was turned into a group ride because of unscheduled blasting by Army engineers on the new Besisahar to Taal road. Stage six, Taal to Chame (2570m), was quicker this year because the road extended the whole way and the hike-a-bike component was removed. The newly-constructed, steep and rocky-road was longer and allowed mountain biking in its purest form: bikers navigated it better than motorbikes and jeeps. From Chame to Manang (3540m) there was significantly more snow and mud than previous years, making the race more fun for many and slower for all. UK rider Neil Cottam crashed out of the race with a dislocated shoulder, yet after popping his shoulder back in continued to trek the rest of the race. Reaching Phedi (4,450m), riders were greeted by a blizzard that dumped 15cm of snow. There was tense anticipation of whether Thorung La would be passable at all. We woke up at 4 AM to clear skies and no additional snow. The snow was waist deep on the pass at Thorung and it resembled a mountaineering expedition with the wrong equipment rather than a bicycle race. Two riders suffering from snow blindness and had to drop out. The final stage from Kagbeni to Tatopani was cut short and turned into a group ride due to an international competitor colliding with a vehicle and others had to wait for the medical team to arrive. He was ok. The new and variable challenges each year are what make Yak Attack unique. Mountain Bike UK has acknowledged this as the fifth hardest race in the world, not because of the distance or technicality, but because of the altitude, snow, hike-a-bike, temperature extremes, and other unforeseeable challenges. But most of all, it has allowed Nepali riders to showcase their endurance and technical skills and be recognised on the international stage. 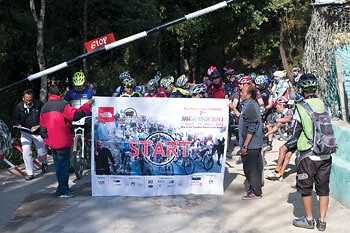 The 10 day-day mountain bike race around the Annapurna Circuit in photos. Photos: NEPAL SUTRA/SAMIR JUNG THAPA (www.clickman.com). The real story of Yak Attack 2013 was the continued dominance of Nepali riders. Narayan Gopal Maharjan became the 5th Nepali to win Yak Attack, while defending 3-time champion, Ajay Pandit Chhetri, finished in 2nd. Young Aayman Tamang, only 19-years-old, rounded out the podium. Every year the competition gets stronger with more international professionals and amateurs taking part, yet every year the Nepali riders illustrate their strength at all altitudes, any terrain, and at any temperature. These riders have immense potential to shine on the world stage and perhaps with proper training could compete in the 2016 Olympics in Rio.